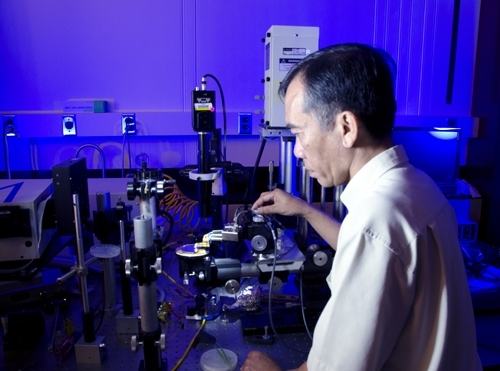 Nhan Nguyen demonstrates how he performs optical measurements on a graphene-insulator-semiconductor sample structure. 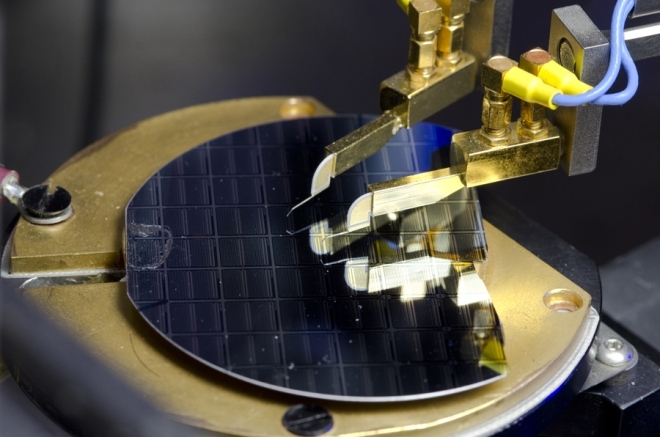 That graphene is the hot new material in the world of future electronics manufacturing is well known. With its high carrier mobility and low noise, graphene is seen as a possible candidate to ultimately replace silicon in integrated circuits. Finding a way to fully characterize new materials such as graphene is critical to the ultimate goal of successful engineering and manufacturing of next-generation devices. Researchers at NIST’s Physical Measurement Laboratory have brought us one important step closer to this goal with the determination of graphene’s work function and the band alignment of a graphene-insulator-semiconductor structure by using the combined optical techniques of internal photoemission (IPE) and spectroscopic ellipsometry (SE). While IPE and SE have been around for a long time, only recently have scientists begun combining the techniques for use in integrated circuit device characterization. IPE is used to measure the energy of electrons emitted from materials in order to determine binding energies. Essentially, a light is shone onto a sample and a photocurrent created by the ejected electrons is measured. In SE, broadband light sources are shone upon a material, and optical properties are ascertained from the reflectivity. Both techniques are truly crafts. Only a skilled practitioner can perform the measurements precisely. A graphene-insulator-semiconductor sample under electrical test. Nguyen originally used the combined measurement techniques to determine successfully the energy barrier heights and band structure of metal-oxide-semiconductor (MOS) devices. Building on that study, his hope was that he could characterize a graphene-insulator-semiconductor (GIS) device in a similarly non-destructive manner. Current methods for characterizing such a device employ destructive techniques for cross sectioning and analyzing. These methods not only destroy the device, but also potentially compromise the very electronic properties that are being measured. Band alignment is important in GIS devices because the correct band offsets are necessary to prevent undesirable leakage currents in device applications. In other words, if the layers are not lined up in a precise way, the device will behave differently than anticipated, perhaps even failing entirely. This information is critical for the successful engineering and reproducible manufacturability and reliability of such devices. Yet, until now, no detailed study on the band alignment of these devices had been reported. Nguyen and his team investigated a structure that consisted of a graphene film grown by chemical vapor deposition (CVD), a degenerately doped p-type silicon substrate, and a 10 nm thick thermal SiO2 layer. The graphene film, a continuous one-atom layer, had the necessary properties (i.e., extremely thin, robust, continuous, and semi-transparent) to enable excellent optical transmission allowing electrical measurements well beneath the surface. Nguyen was also able to determine the work function of the graphene layer, which can vary greatly depending on what the layer is placed upon and other environmental factors. Future studies will focus on the possibility of reproducibly controlling the energy properties of the graphene layer based on the needs of the end device. 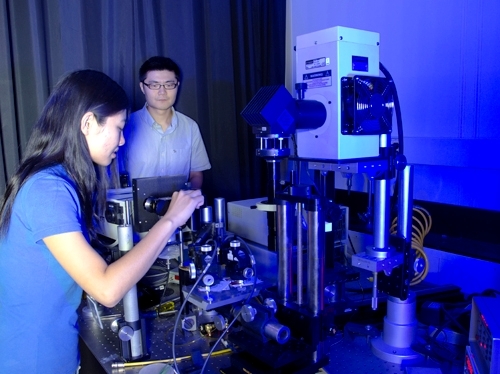 Guest researchers Qin Zhang (left) and Rusen Yan (right) align the sample. The potential impact of this completed study and published results* on the development of future devices is substantial. Instead of developing a device and destructively measuring what was built afterwards to determine its electrical properties, devices can be engineered with known electrical behavior from the start. “Nhan’s technique is extremely valuable in advancing future electronics in the fronts of semiconductor electronics, advanced manufacturing, and nano manufacturing,” Gundlach concludes. In addition to studying the manipulation of energy levels in a graphene layer, future studies will utilize graphene’s unique properties to study other materials. Since graphene can be applied in a very thin and continuous layer, it allows for much better optical transmission than the semi-transparent metals previously used. Nguyen intends to stack the graphene layer onto other layers with unknown properties, using the graphene as a key to understanding the unknown layers beneath. “This has given us access to measurements that were previously unavailable,” Nguyen states. This is critical as the industry moves beyond CMOS technology. New semiconductor materials used in more complicated device structures and architectures need to be characterized. And now Nguyen and colleagues have demonstrated a non-destructive way to do it.